KFM LED has a heavy-duty, all metal construction with a sleek design, adjustable arm and excellent light output making it suitable for a variety of industrial applications. The spring-balanced 45" arm provides maximum vertical and horizontal movement, and will always stay in the right position without drifting. Supplied with a 3 Diopter (1.75X) 5" diameter optical-quality glass lens. A cloth shade cover is provided to protect the lens from unwanted dust and debris. Provides nearly 75% greater light output than traditional KFM models. 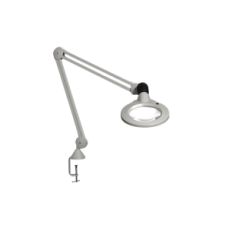 Provides virtually shadow-free magnification and excellent color rendering. The semi-circle LED modules consume a total of 11 watts of energy, are infinitely dimmable, and include a 9/4 hour automatic shut-off functionality.